Our USED BMW 323i ENGINE assemblies include the oil pan, short block, cylinder head and valve cover only. Any brackets, accessories, or misc. parts that are attached to the motor are not included in the purchase price. Meaning... we do not charge extra for them. However, any additional parts left on the motor are not covered as part of the engine's warranty. Please call 800-269-8970 or EMAIL US with any questions. Why buy your replacement BMW 323i Engines from Bavarian Auto Recycling? We have an excellent selection of good running used BMW 323i Engines in stock and ready to ship. 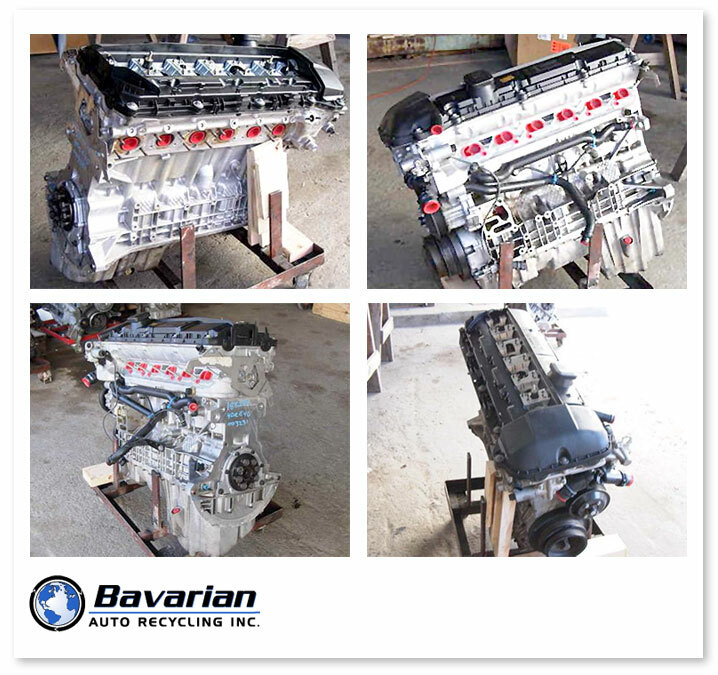 Save 50%-70% off dealer prices by purchasing a quality used BMW 323i engine directly from Bavarian Auto Recycling. Cleaned & Tested -- All BMW 323i engines are compression tested and leakdown checked. They are dyno tested at 1200 rpm to confirm correct oil pressure, expose oil leaks, and check for any abnormal noises while running. If they pass all of the above quality control tests, they are sealed up with cap-plugs, jet washed, dried, sealed in plastic, and palletized for secure shipment. All used BMW 323i engines from Bavarian carry a 2 year, unlimited mileage warranty used BMW engine replacement guarantee. Used BMW 323i engine prices can fluctuate slightly due to supply and demand so please call (800)269-8970 to speak with one of our customer service representatives and receive a current price quote on a BMW 323i engine. Your quote will include a reference number that locks you in at the lowest price for 30 days - and makes ordering a snap. We can also ship directly to your BMW dealer or any BMW repair facility nationwide. Click here to see the used BMW engine applications, BMW part numbers, and our entire BMW parts catalog.